What Are They Saying About ATF? "...one of the most purely *fun* flight simulator experiences in existence today." 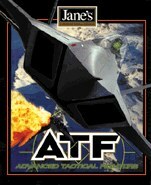 "If this debut product is any indication, the Jane's Combat Simulation line is something sim fans can really be excited about." All contents ©1996 Electronic Arts, Inc.